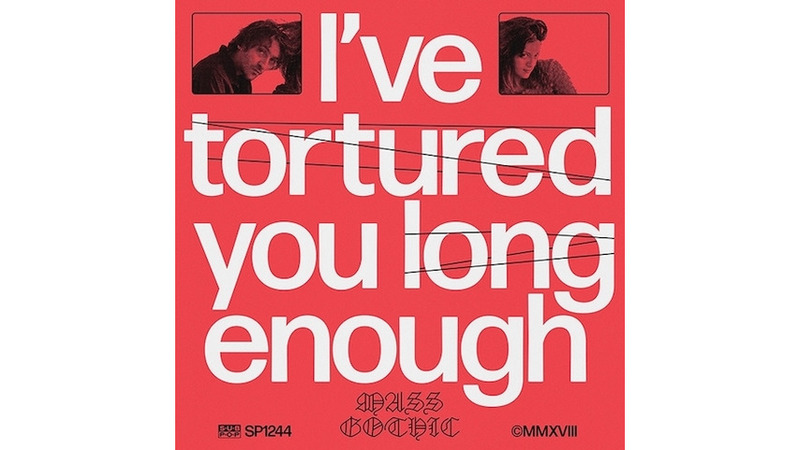 “I have / I have / tortured you / long Enough.” Surrounded in droning synth and cymbal patters, these are the only lyrics to the title track of Mass Gothic’s latest LP. Repeated like a mantra, it begs you to find meaning. Formerly a solo project by Noel Heroux (Hooray for Earth) I’ve Tortured You Long Enough, sees him bringing his wife Jessica Zambri on board for an album of navel-gazing at their own relationship. Are they serious? Is it an inside joke? A sardonic take on how in love they are? According to the rest of the songs on the album, it’s all of the above. Though longtime collaborators, this album marks the first time Heroux and Zambri have committed to a full-length album together, making an album that, according to a statement from the band, “basks in the acceptance of co-dependence.’’ Hopping back and forth between the emotions one feels in a committed relationship—the overwhelming love and sense of security vs. the terrifying and claustrophobic suffocation those very feelings can bring—it’s hearty territory to explore. “I’m underwhelmed / This isn’t living,” Zambri sings in her bright, breathy voice on opening track, “Dark Window,” as greasy, crunchy guitars underscore her discontent. Heroux voices his own doubts on the churning and chugging “Call Me.” “Walk a line / Chase a tail / Find a way / Way to bail,” he sings, the commitment-phobe’s sacred text. While the writing is solid and the sentiments definitely worthy of a deep dive, the music backing it makes it difficult for any of that to stick. Industrial dance vibes with a power-pop chorus (“Call Me”), archaic synths and fist-pump, kick drum beats accented with a trumpet of all things (“Keep On Dying”). The compositions are kinetic, but difficult to make sense of, ultimately failing to hold your attention or interest. The dated, and not in a good way, darkly-romantic club vibes distracting from the genuine emotion and vulnerability at the heart of each song. The one winner is “How I Love You,” the ache and emotional fidelity in Zambri’s vocals making her sound like the softer side of Patti Smith. “I want the whole world to know your name / And count the ways that / I love you,” she sings, a gently lilting melody. A flat-out love song, the stripped-back instrumentation makes it the quietest moment of the album, one better suited to Zambri’s voice and the ardent emotions being explored. Conversely, “Big Window” attempts to finish things off in a big way, a slow build over nearly six minutes. “Watching the unfinished movie / Every scene’s always new to me,” Heroux sings with a resigned peacefulness in his voice. It’s around the 3:30 mark that it opens up, erupting into noise with Zambri hollering “It never happened” into the abyss, adding one last element of couple’s therapy exercise before the album fades out. A weird blend of rave rhythms, distorted guitars, druggy aimlessness and less-than stellar vocals, I’ve Tortured You Long Enough sounds like something out of early ‘00s New York City; the product one of the bands that definitely didn’t make it. It’s an album that explores what happens when you’re simultaneously grateful for, but picking apart—and sometimes resenting—your relationship. For better or worse, their own relationship seems to be more successful than the album.